As you might remember from your history, culture and archeology lessons even ancient people realized the importance of the heart. They believed it to be the center of human body, the container of the soul and the home of love, kindness and every positive human quality imaginable. “Your hart is cold” or “You have no heart at all” we keep saying nowadays trying to show the person is cruel and indifferent and following the beliefs of our ancestors. Modern science proved that ancient people were right considering the heart to be so vitally important. As researchers state, the heart is the epicenter of life activity. To see how big your heart is look at your fist – this is the approximate size of your heart! It is a hollow organ divided into four basic chambers and serving as a general pump of the body. As a rule adult female heart weighs about 225 grams, adult male heart weighs a little more, about 310 grams. Taking normal heartbeat, the heart makes about 42 million contractions a year and pumps about 700,000 gallons of blood through every organ of human body. The heart is positioned in the chest between the lungs in a special cavity known as mediastinum. As a rule, 2/3 of the heart is positioned to the left from the logical center of the body. The heart’s cone shaped or the apex is on the bottom protruding into the diaphragm. At the heart’s base or its superior broad end the largest blood vessels are connected. There is dense fibrous connective tissue surrounding and protecting the heart named the parietal pericardium. It looks like a loose sac around the muscle and is filled with special pericardial fluid ensuring smooth heart movements in a state of suspension within the sac. There are also three special layers creating the outer wall of the heart. It is epicardium also called the visceral pericardium. It creates the outermost layer of the heart wall. The myocardium, thick layer of muscle squeezed as the heart beats, is the middle layer of the heart wall. The endocardium of the heart wall is the third inner layer. By the way, heart valves are covered with the endocardium, too. As we have mentioned before, the heart is made up of four chambers - two upper and two lower chambers. The upper right and left chambers are called the atria. The lower right and left chambers are the ventricles. The atria always contract at the same time, so do the ventricles creating the heart’s pumping action. Contracting the atria let the blood flow into the lower ventricles. Each chamber of the heart is its own separate entity. The upper chambers are separated with a thin wall, the interatrial septum, inside the heart. The lower chambers are separated with a thicker interventricle muscular wall. The atria and the ventricles are separated with atrioventricular valves. 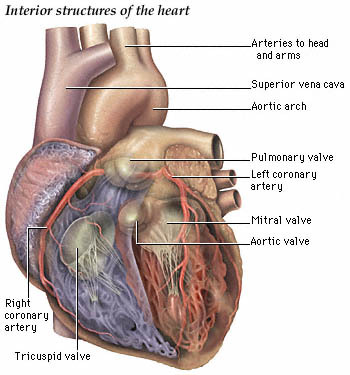 The two major blood vessels of the heart are separated with so called semilunar valves. The valves are vital for letting the blood flow in one direction only. The function of the right side of the heart (a ventricle and an atrium) is to receive the blood with little oxygen and forwarding it to the lungs. The function of the left side of the heart (a ventricle and an atrium) is to receive the blood with high oxygen concentration and forwarding it to the rest of the body. The aorta runs down from the left ventricle, it directs the newly oxygenated blood to the entire body. There is a valve known as the aortic valve at the bottom of the aorta, it shuts off the blood flow between contractions of the left ventricle. In short, the heart of any human being is too wondrous to be destroyed by constant stress and crazy speed of modern life! Take care of your heart to live a full and delightful life!